So, every so often I come across a food or dining-related giveaway and after submitting my own entry think, “I bet my fellow Noshers would totally love this prize!” For some reason, that hasn’t translated into blog posts – but there’s always a first for everything, right? 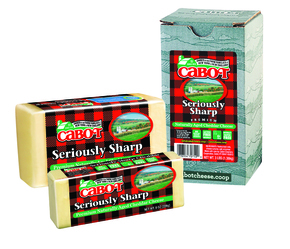 I just entered a giveaway that Cabot Cheese is hosting with a grand prize (3 of them, actually!) of a dinner party for 10 friends at your home, fully catered and staffed. Cabot Creamery’s Chef, Jimmy Kennedy, will create a menu inspired by one of three menu themes – BBQ, Comfort Food or Foodie Fare (I think I’d choose Foodie Fare – you?). Never mind the teeny tiny fact that my teeny tiny NYC apartment can hardly fit 5 people, let alone 10 – if I win I’m sure a friend would volunteer their place in exchange for a catered dinner party, right? 🙂 The contest is open to those living in the NYC area – soooo *I’m* thinking if you’re not local, you should totally ask a NYC area friend to enter and then invite yourself to that dinner party. Right? Right?? You can enter the giveaway via Cabot Cheese’s Facebook page, where there are a ton of recipes featuring Cabot Cheese (Bacon Jalapeno Mac ‘n Cheese, anyone? ), until New Year’s Eve. On a related note, did you know that Cabot Creamery is a dairy cooperative made up of 1,200 farm families? I had no idea, and I think that’s pretty cool. A dinner made of cheese? And I don’t have to go anywhere? Yes and yes. Did you win? Did you win? Well, I’m coming over anyway . . .